A new take on the classic medley of seasonings known as adobo, this easy dry rub creates pleasantly aromatic lamb chops. In a dry skillet, toast fennel, cumin, coriander and pepper for a few minutes until aromatic; let cool and grind coarsely in a spice grinder or blender. Stir in salt, garlic, oregano and lime zest. Add the thyme and rosemary to the spice mixture. 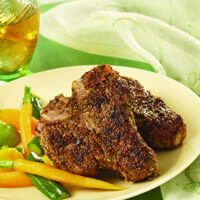 Rub both sides of each lamb chop with about a tablespoon of the spice mixture; cover and marinate for at least 1 hour. Heat ovenproof large skillet over medium-high heat; add 2 Tbs of oil, heating until it shimmers. Place lamb chops in hot pan and sear for 3 minutes; turn lamb to sear the second side for an additional 3 minutes. Place the pans into the 400ºF oven; bake for 5 to 10 minutes or until lamb is cooked to your liking.